You can connect as many SharePoint Online (SPO) libraries as you'd like with Qorus. You can either connect multiple libraries as one SPO library content source, or you can create multiple content sources that each point to one SPO library only. Or even a bit of both. Before you can connect any SPO libraries or lists to Qorus, you need to have at least 'Contribute' rights to these places in SPO, and you also need to belong to the Qorus Admin role. Further below, we also explain the search options available for SPO library content sources, how to set up SPO library search filters, and what to do in Qorus if your SPO library structure changes. Let's get started with the steps. On the 'Configure Content Source' screen, give your SharePoint Online Library content source a name, and copy and paste the URL for the SharePoint Online site that houses the library or libraries you'd like to connect. When you're ready and if you don't plan on setting any advanced options, click on the 'Next' button (bottom right) to go to the next step. Click on 'Show Advanced Options' to see the options available. These are all completely optional. If you'd prefer to skip ahead to the next step, click here. By default, Qorus will display the SharePoint logo next to SharePoint Online content sources in the Search pane. You can however add your own custom images for each content source, making it easier for users differentiate between content sources, especially if you have many connected to your Qorus Hub. 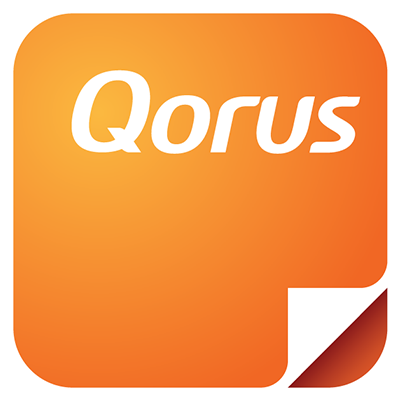 If you have implemented search ranking models in SharePoint, and would like Qorus to use the same search ranking model, this is where you can choose the one Qorus should use from the drop down menu. Delimiters are a sequence of one or more characters used to specify the boundary between separate regions of text, like a text placeholder. You can read more about them here. By default, delimiters are defined at Hub level - meaning that they apply to all content across your Qorus Hub, no matter the content source from which the content is served. Here, you can override the delimiters set at Hub level and enforce content source specific delimiters. The delimiters you specify here are the only ones that will be considered valid for the content served via this content source. When you're ready, click 'Next' (bottom right) to move on to the next step. To choose the places you'd like to make searchable with Qorus, otherwise known as search locations, all you need to do is check the boxes next to the libraries and/or folders you'd like to include as part of your content source. In the example below, we're connecting the Graphics Library, the whole Marketing Collateral library, as well as two out of three folders in the Proposal Library. If you're done, click on 'Finish' (bottom left). Otherwise, carry on with the step below to add save locations to your content source. 'Save' locations work hand in hand with the Qorus Clip, Create and the Cart. Here again, all you need to do is check the boxes next to the libraries and/or folders you'd like to make available as places that users can choose to save new files to. In the example below, we've selected a Drop off library, as well as the Client Proposals library that we happen to have as a part of the Proposal library. Although here we've deliberately picked different libraries for our search and save location, there's nothing preventing you from setting up the same libraries / folders to be both search and save locations. When you're done making your selections, click on 'Finish' (bottom left). This content source can be searched using the search box, browsed by simply clicking on the content source name, and also searched with the help of search filters. You can find in depth information about search capabilities in this article. Qorus automatically builds up the list of search filters for a content source based on the Managed Metadata columns it finds in the libraries you've connected. So the setup does not actually take place in Qorus at all, it takes place in SharePoint itself. If you've never heard of Managed Metadata, then you might want to check out this article first. Otherwise, proceed to this article to learn how to create Managed Metadata columns in SharePoint. You'll want to add the Managed Metadata columns to your SPO libraries, and then categorize your content by filling in those columns. This is considered best practice and can be key in ensuring that your content remains easy to find, especially when you have a large volume of files and potential search results to wade through. Qorus won't automatically pick up any fundamental changes in your SharePoint structure, such as renaming libraries or folders, or adding, deleting or renaming Managed Metadata columns in the libraries connected to Qorus. For this reason, you will need to update your content source in Qorus, so we can pick up the structural changes you've made in SharePoint. This will take you to the search location setup screen. If the only things that have changed are the Managed Metadata columns associated with your libraries, then there's no need to do anything here - simply click on 'finish' and Qorus will rebuild the list of custom search filters to include your Managed Metadata column changes. If libraries / folders have been renamed, or deleted, then you can make changes to the search and save locations you had previously selected here. When you're done, click on 'Finish'.